Fastsigns Peterborough is a well-established and profitable business located just off the city centre. Established in January 2006, Fastsigns Peterborough operates from a prime location close to the city centre of Peterborough. The premises occupies over 1800 sq ft with five parking bays for customers. It is up to date and modernised. A fully staffed team of three are all highly experienced, collectively boasting over 40 years in the signmaking and design industry. 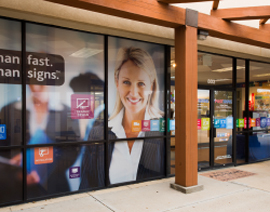 Fastsigns supplies signs and display products of all types to local and national businesses. Being part of the Fastsigns International Incorporated franchise network provides access to the Fastsigns business system. This system manages the whole process from marketing and sales through to fulfilment and accounting. All businesses need signs and the market includes a complete range of industry sectors. Products include almost anything that can be described as a sign. In-house manufacture is focussed on cut vinyl and digital print graphics with the majority of production manufactured in-house. The sign industry has not been as influenced by external downturns as other industries and Fastsigns held its position throughout the last recession. Fastsigns are full members of the bfa. The bfa (British Franchise Association) is the only voluntary self-regulatory body for the UK franchise sector. Its aim is to promote ethical franchising practice in the UK and help the industry develop credibility, influence and favourable circumstance for growth. It does this with a strict standards based approach to membership of the association. Wishing to retire the Fastsigns Peterborough business is available to offers in the region of £79,995, please be aware that this a franchise and there will be extra costs on top of the sale price.